mwe3: Is your surf-jazz sound turning into a kind of ongoing musical series? It seems like with both your Horse Riding Heroes album and now with Secret Agent youve tapped into an interesting musical vein for guitar players to aspire to. Are you bringing back the Hank Marvin guitar sound back to the music world of 2017? Philippe Caillat-Grenier: This is the feeling I had during that period. Can it be for the next one? This style of music forces the composition to give the impression of simplicity, and minimalism. I love this era of the 1950s and 60s, which gives a joy of life. mwe3: Who played with you on the album? Did you change the band sound around on Secret Agent and who did the engineering, mixing and mastering? You must have had some specific ideas about the sound this time. Philippe Gaillot, who had a big influence in the realization of the sound of this album! For the sound this time we chose less reverb and more direct. mwe3: Blue Fields is a great way to start the Secret Agent album off. The song chords are interesting in that its a very circular type of composition. Sounds like you dropped the fans in the deep end right away! Philippe Caillat-Grenier: In this piece it takes minimum of 3 guitar harmonics and the rhythmic work is very important! To have this sound there is a harmonic part in the low strings and another in medium and rhythmic high strings that returns later. mwe3: How about your song Ghosts? Ghosts has a great air-like effect, almost weightless like a ghost! Philippe Caillat-Grenier: I imagined two ghosts who pursued it, pushed by the wind! mwe3: Does Lets Go show your American country style guitar picking roots? How influenced were you by Nashville and what country music guitarists influenced you? 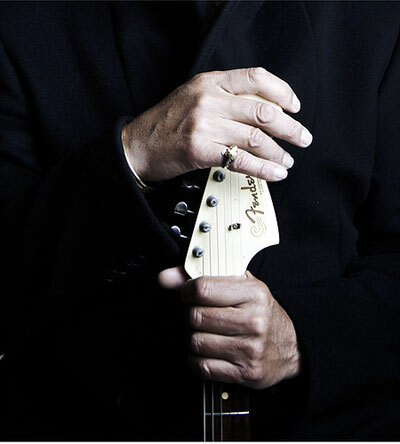 Philippe Caillat-Grenier: I always had a great respect for all those pioneers of blues-rock and country. There are too many to quote them and I fear after forgetting. mwe3: Another favorite on Secret Agent is Sparkling Pants. It has a late 1970s Shadows beat, almost disco yet the song has great energy. Do I detect a kind of Hotel California circular chord sequence? 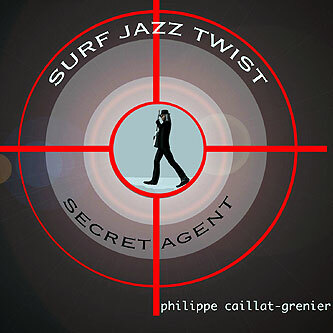 Philippe Caillat-Grenier: Your analysis and perfect super bass super drums. Disco pants and glitter! mwe3: Obsessions sounds like the name of Bond film theme song. What were some of your favorite Bond movies or other movie soundtracks influenced your guitar playing? Philippe Caillat-Grenier: Goldfinger. I love the composition! mwe3: Beatrice has a kind of Santo & Johnny effect. Were you going for a kind of retro NYC circa 1961 kind of sound? That kind of polarization between the hard jazzers and the burgeoning, early rock and roll scene. Philippe Caillat-Grenier: Yes that was my inspiration for a declaration of Love to Beatrice. The same parts of the guitars are very precise to replace the pizzicato violins. mwe3: Wild Horse is a cool track. Does that track get back to your western cowboy influence? Is there a kind of Bollywood effect on that song? Philippe Caillat-Grenier: Once again Robert you saw just that is exactly the right analysis! mwe3: How about Happy Cats? Thats another song that has a kind of cool retro bop, Les Paul effect on it. mwe3: The title track Secret Agent is one of your best. Did you set out to make a kind of action type theme song. I imagine every country, France included, had their own spy movies and TV shows back in 1960s! Philippe Caillat-Grenier: Yes it is all these series and the films where there are always beautiful car chases with many tensions! mwe3: It seems like you cant break free of the 1950s on the CD closer Romantic Lover. Its very much rooted in that 1961 sound as well. 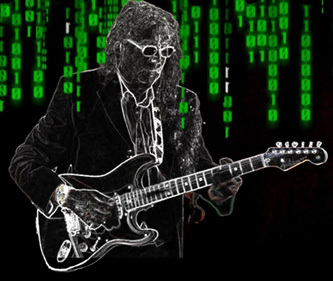 Its just amazing how well you combine your famous jazz-rock guitar sound within the realm of Santa & Johnny meets Hank Marvin sound that Secret Agent does so well. Philippe Caillat-Grenier: This is the feeling I had in this period. As I told you I love this time, and I do not know yet or if the wind will push me, but there is a lot of musical direction but I let life make me move! 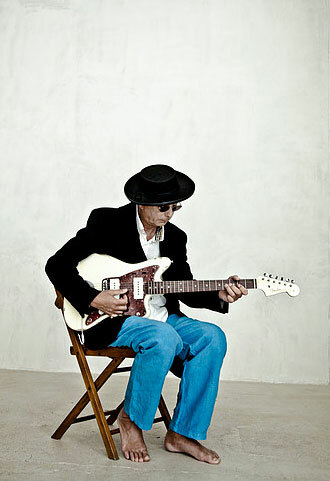 mwe3: Last time you played the Fender Relic Jazzmaster a lot on Horse Riding Heroes. Were the same guitars used on Secret Agent and were any new guitars or guitar sounds added this time? Are you listening to any new music these days by other guitarists or artists? Philippe Caillat-Grenier: No change, it has remained Fender Jazz Master, Fender Telecaster, Fender Baritone Sub Sonic and Fender Stratocaster. I listen to everything and mostly classic music and when I'm in the car I love Mozart! In the world of guitar there are many very great performers in all styles. For me music is like painting with infinite colors. mwe3: Some fans just started listening to you after Twist For Horse Riding Heroes album and now with Secret Agent they might not be fully aware of your vast output of music going back 35 years at least right? Also would you consider doing a double disc box set to put your career into perspective? Looking back on the early years, what were some of your favorite solo albums that you made over the years? Secret Agent is like a trip through time so I hope there will be more!